Q: What is the Femur? A: What is the Femur? What Is a “Wheat Belly”? This post is for anyone who has never roasted a Turkey. It is really easy once you do it a few times and gain some experience – much like learning a new exercise! Repeat, Repeat, Repeat. I used to think I was a lousy cook, but I just never gave myself a chance. I’d try something once or twice and if it didn’t work out I figured that I just wasn’t cut out for cooking. But, I’ve learned that finding the right recipe is more than half the battle. I often chose recipes that looked amazing – some complicated, others simple but if the flavours didn’t appeal to me, then in the end it would feel like quite the disappointment, a waste of time and waste of ingredients. Now, from reading a recipe I know if it’s worth the attempt. And I’m figuring out how to use a recipe as a template and work with the ingredients that are compatible for me. But really, the entire point of roasting the turkey is to be able to make homemade turkey stock – to make the best turkey soup you’ve ever tasted! Really, before Winter comes to an end you will want to learn this and be ready for next Fall. First make sure you have all the necessary kitchen supplies at hand. Lay everything out ahead of time – like a cooking show – it really does make everything run that much more smoothly. 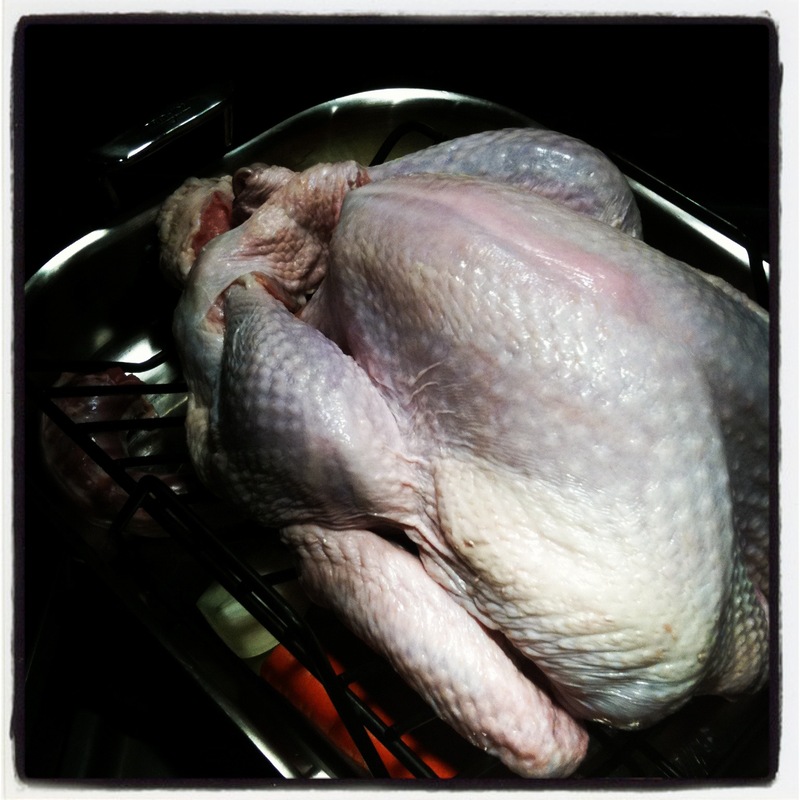 With a garbage can by your side, place Turkey (which is still in it’s sealed bag) into the clean sink. Remove the Turkey from the bag. Turkey is now sitting in the clean sink. Discard the bag to the garbage. If your Turkey has the neck in it’s cavity, remove, rinse and dry it. 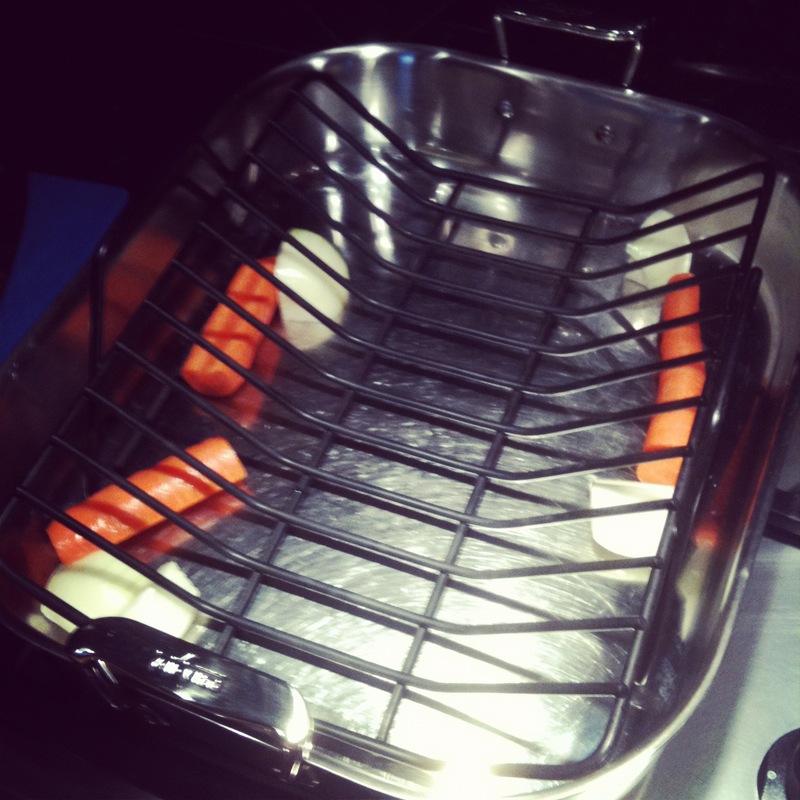 Place the neck into the Roasting pan to the side of the roasting tray – along with the carrot and onion. You won’t be eating the neck, carrot or onion – rather they will provide nice flavour for the gravy – later. Inside the Turkey’s cavity you may also find a plastic bag holding the giblets (the heart, liver and kidneys)…I discard these along with the outer bag. 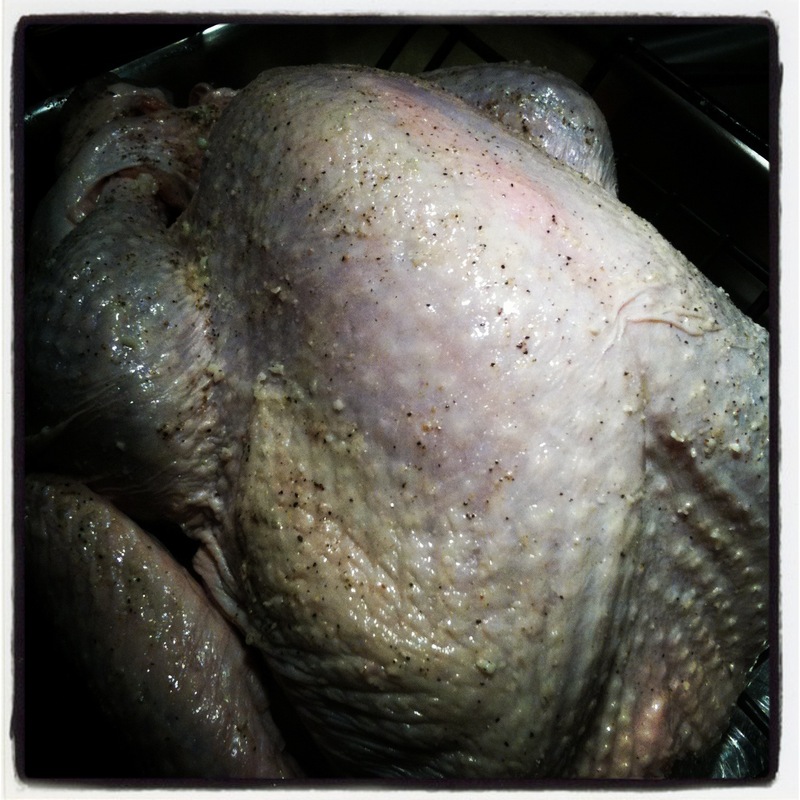 With cold water, rinse the Turkey well, inside and out. Be sure to drain all the water from the cavity before placing it on the paper towels which are covering your clean counter or cutting board. Dry the Turkey well, inside and out with paper towels. You won’t see any pictures of this…sorry, you’re on your own. Try not to splash your entire kitchen in the process. And make sure to not leave any paper towels inside the cavity! Double check. Once dry, I find it easier to just place the bird on the tray. Rub the melted butter all over the outside of the Turkey. Try not to let it all run into the pan! Your Turkey will still be cold from the refrigerator, so the butter will harden slightly as you rub it on – that’s ok. Then, rub some of the salt and pepper all over the outside of the Turkey and into the cavity. You can experiment with different herbs – this time I forgot to add any – but you can add fresh sage or a few rosemary sprigs into the cavity. That’s it. Now it’s ready to go into the oven. I lightly sprayed the shiny side of a long sheet of aluminum foil with Canola Pam. 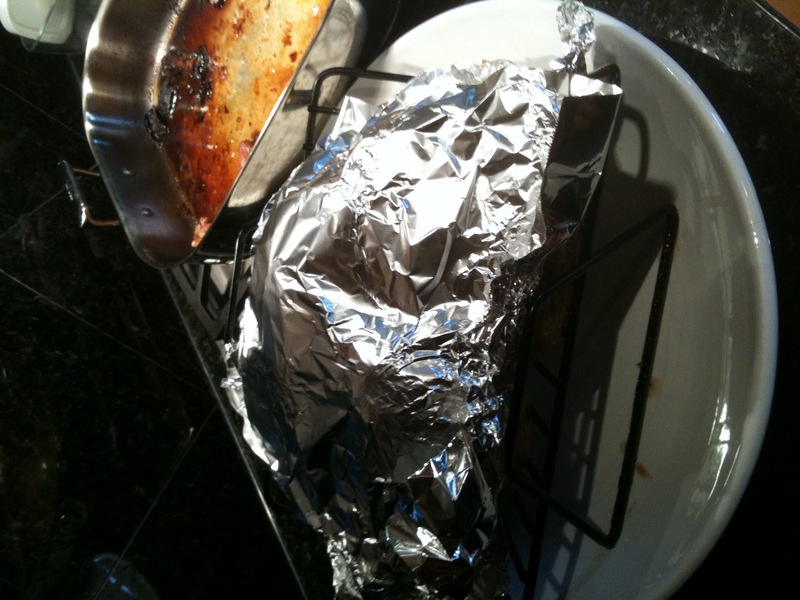 Then I tented the foil over top of the Turkey (oiled side on bird), trying not to let the foil sit on the Turkey – hence ‘tent’. 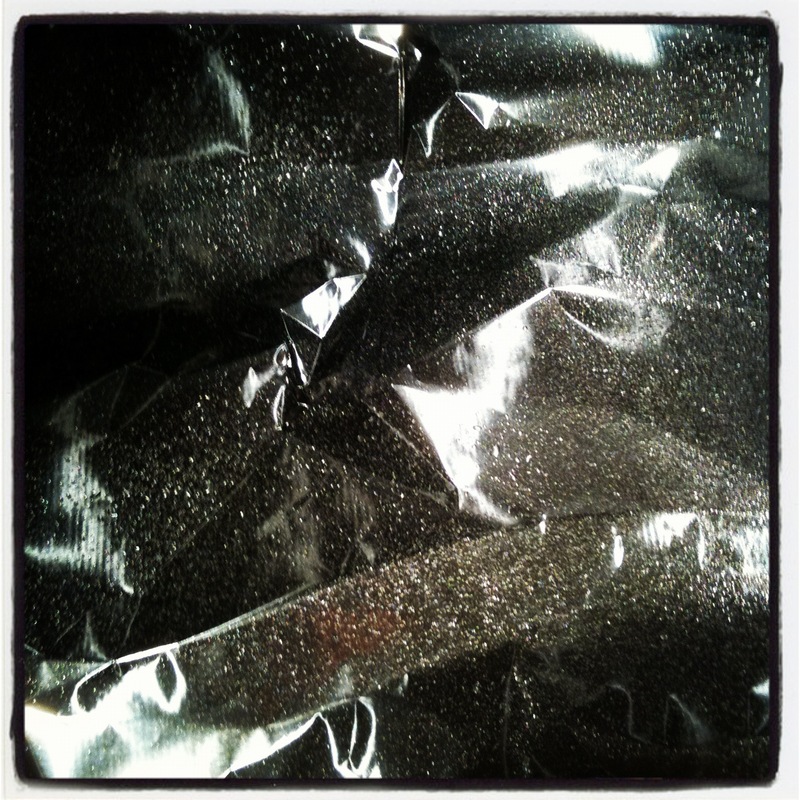 The oil is to help prevent the foil from sticking on the skin should the two come in contact. First 45 Minutes at 425 F.
Then lower the temperature to 325 F for the remaining time. 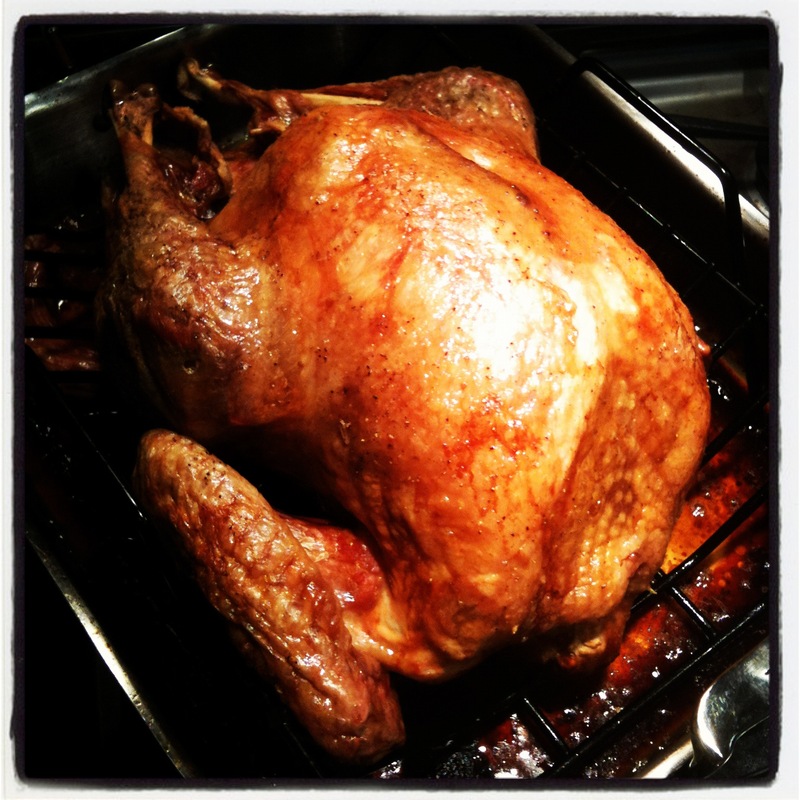 For this Turkey, it was 2.75 hours @325F. 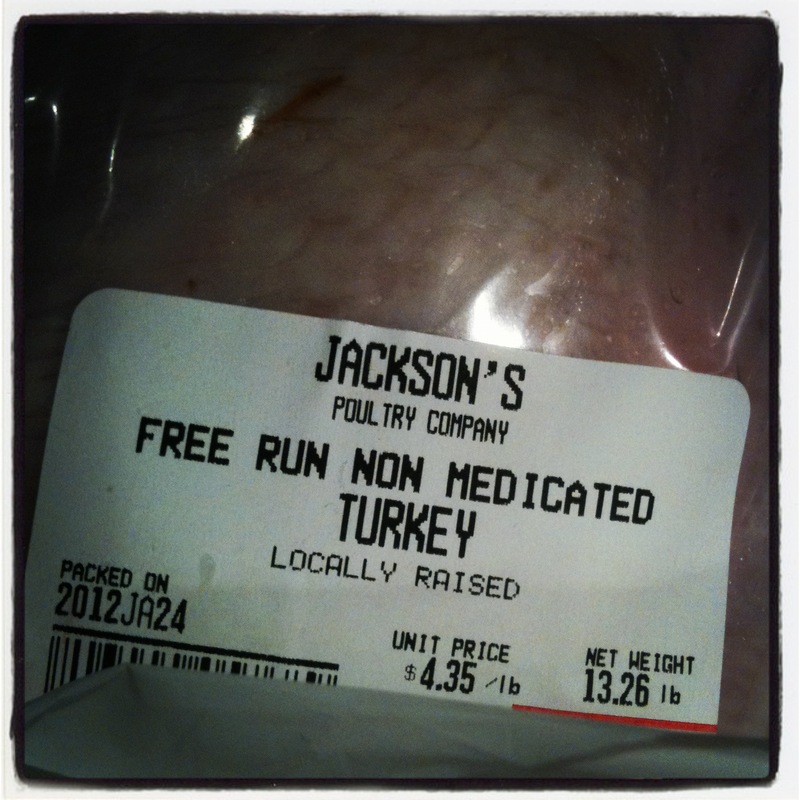 General rule is 15 Minutes per pound unstuffed and 20 minutes per pound stuffed. But everyone you talk to will have a pattern that works for them. So far this has worked wonderfully. The skin gets nicely browned and crispy (though I don’t eat the skin – looks pretty though). You may want to pull the roasting pan from the oven periodically to check on the turkey and baste it if necessary. This size of Turkey roasted perfectly on its own. I didn’t have to baste it. 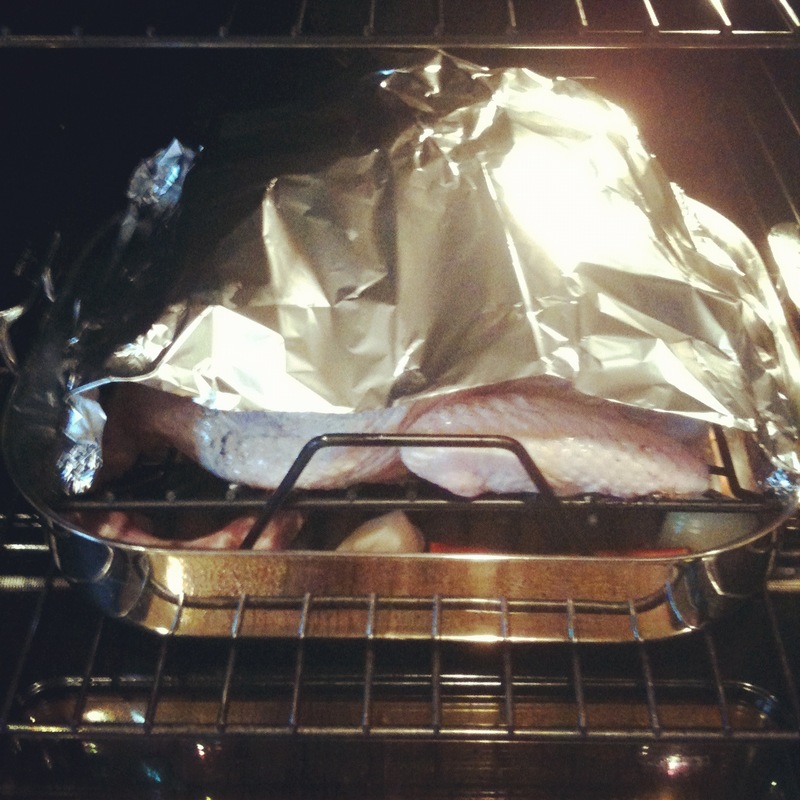 Take the foil ‘tent’ off the Turkey one hour prior to the end of cooking, depending on how the skin is browning. Reserve the foil for later. If it’s looking like it is getting too dark then you may decide to leave the tent on. Experiment. Place a platter or carving block with grooves for catching the juices onto the counter beside the stove top. Once the Turkey has finished roasting, place the roasting pan onto the stove top elements. Transfer the roasting tray on to the platter or carving block. Cover the Turkey with the foil used for tenting, plus another piece if necessary then cover the foiled turkey with a few clean tea towels to keep the heat inside the bird. Let the Turkey rest for at least 20 minutes before carving. 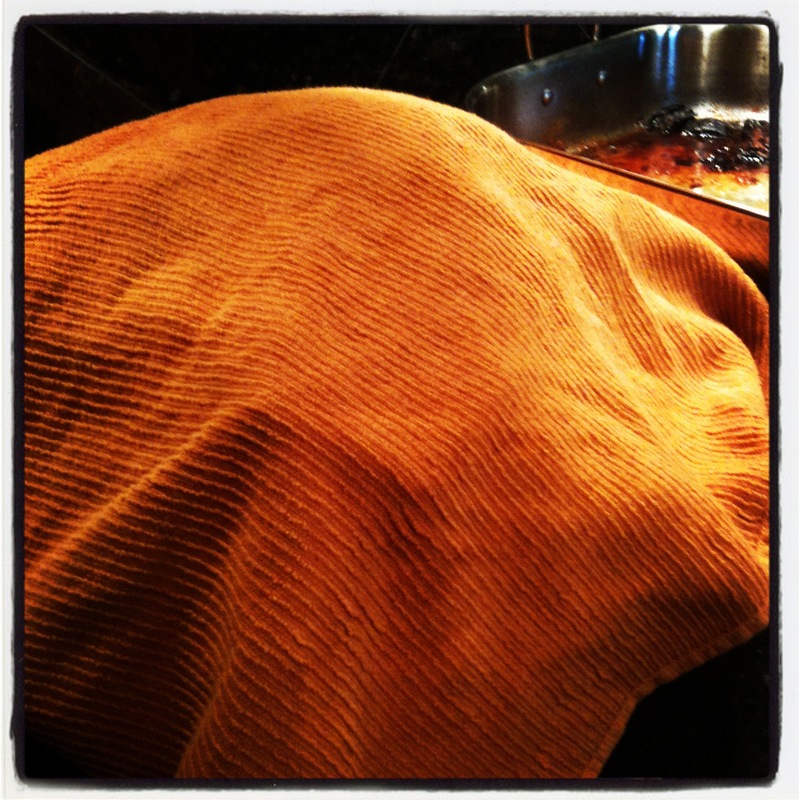 The resting time allows for the juices to settle back into the meat, which is what you want. Make sure the tea towels don’t fall into the platter or carving board – the towels will absorb any juices that can be poured into the gravy. 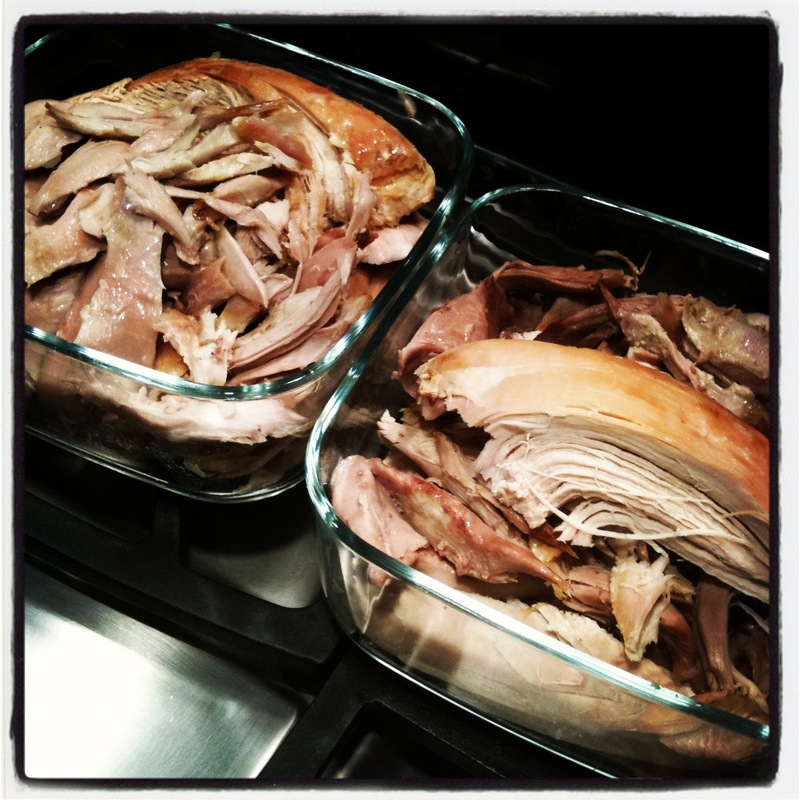 Juices from the Turkey should have dripped into the roasting pan. Remember to discard the onion, neck and carrot from the roasting pan. You will have a nice collection of fat and juices for gravy. I’ll have to show you that another time. It’s pretty easy to make the gravy. Below, is the amount of Turkey I was able to cut away. Each of these glass dishes holds seven cups! We ate some for dinner that night, and most of the leftovers was reserved for Turkey Soup. Now you’re ready to make the turkey stock. But wait till I post those instructions before you run out and order your turkey! Coming soon! We do ourselves a service if we focus less on the aesthetic and more on our body's function. Any time you move your body there is a risk for injury. Daily maintenance may minimize that risk. You As A Machine or those associated will not be responsible or liable for any injury sustained while exercising.